If you want to sync all the notes in a grouped track, simply choose one of the tracks in the group. Now choose "Sync All Notes In Group" from the tool menu under "Ledger`s Scripts" . Tracks will be synced left to right. There is also an assignable keyboard shortcut with the same name. 1. From the tool menu under "Ledger`s Scripts" enable the option "Auto Sync all notes in (*) Groups Enabled"
2. 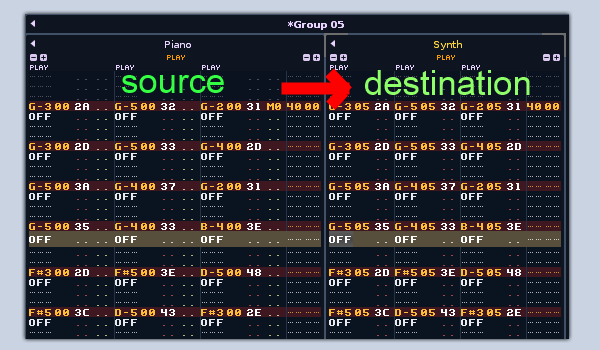 Choose the track you want to double, go to the instrument list and choose the new target instrument you want as a layer. Right-click to get the instrument list menu and choose the "Create Synced Track" option. A new track will be added to the right of the original track. Both of these tracks will be added to a new group with a name like `*Group 02`. All the notes in this group will now be automatically synced, left to right. If you want to bypass a group you can delete the star manually. A star can also be added to any other groups you already have to make them automatically sync aswell. "Sync All Notes, Alternative Undo"
To help keep things tidy there is a menu entry for "Collapse All Synced Tracks". This will collapse the destination tracks in * groups. A keyboard shortcut under the same name is available. -Option for "Only Sync Selected Group Enabled" added under "Ledger`s Scripts" / "Sync All Notes In Group". etc. which is the trade off.